← Costanzo wows us with his mussels! Finally the weekend is here after a very strange week in Glasgow and also most of Europe! 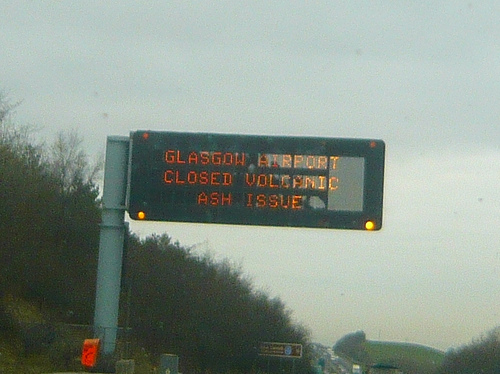 Iceland has very kindly donated its huge cloud of volcanic ash to most of Northern and Western Europe resulting in a complete shut-down of most of its airports and causing total chaos to everyone hoping to travel anywhere in this area. It’s happened at the worst time being the end of the Easter holidays with many people stuck abroad with no idea when they are going to get back! With the wind changing direction the ash is heading further across Europe with airports in Northern Italy now closed for the foreseeable future and who knows when this chaos will end. Great news if you are in no rush to get back to work or school and can have an extended holiday in the sun (provided of course you have enough spare cash to keep you going!). So, there are tens if not hundreds of thousands of people stuck for the time being in a place they shouldn’t be. Why not make the most of it and enjoy the break. Go out and see the sights of the city you may not have had time to do before, relax and savour the silence of the strangely quiet skies above you and lastly, don’t panic! You’ll get where you need to be eventually, some time soon hopefully! We are still here though and going nowhere soon. If you happen to be stuck in Glasgow at least you know you have a great meal to look forward to if you pop by. No chances of falling volcanic ash coming from the skies and resting in your spaghetti, one of the bonuses of being in a cozy little basement! Sit back, enjoy a nice glass of wine and put thoughts of travel out of your minds for now. We, at The Caprese, are saying a big collective prayer for all of you that are stranded somewhere and hope you get away soon. Until then, enjoy the unexpected holiday! In bocca al lupo!